What's this bright yellow deer all about? That's the question the J.A. and Kathryn Albertson Family Foundation want you to ask. Earlier this year, the Inlander asked a big question: Why are so few Idaho kids going on to college? Not just a four-year college, but community colleges or tech programs. The Go-On rate is stuck around 50 percent. It's a problem that's nearly as bad in Washington and Oregon as well. But Idaho has the J.A. and Kathryn Albertson Family Foundation, a well-funded organization that's been trying to fix that problem since 2008. They launched multiple ad campaigns, gave grants to schools, and gave universities scholarships. And in some schools things got better. But statewide, the numbers have remained dismal. That's where a giant bright yellow deer sculpture comes in. Starting today and lasting through the weekend, the Albertson Foundation has a booth at the North Idaho Fair and Rodeo aimed specifically at teens. Seriously, they won't even allow adults in. The new pop-up marketing campaign is called "More In Store," and appears in five different Idaho fairs throughout the state. And they aren't focusing directly on college, or even on careers, specifically. Instead, they're aiming at the philosophical root, asking kids not where they want to go to college, but what they want their life to look like. "What are you passionate about?" Groff says. "What do you like in life? What kind of career would you like? What are the tools you need to get there." The teens visiting the booth at the fair can select a tennis-ball-style canister with inspirational messages on them. Messages like "Concentrated Nerve," "Raw Potential" and "Guts and Grit." Inside the canisters, they'll find sunglasses, stickers, an informational card, and — in two lucky canisters — a golden ticket that can be exchanged for an iPad. Booth visitors can also register to be entered to win a laptop or another iPad. 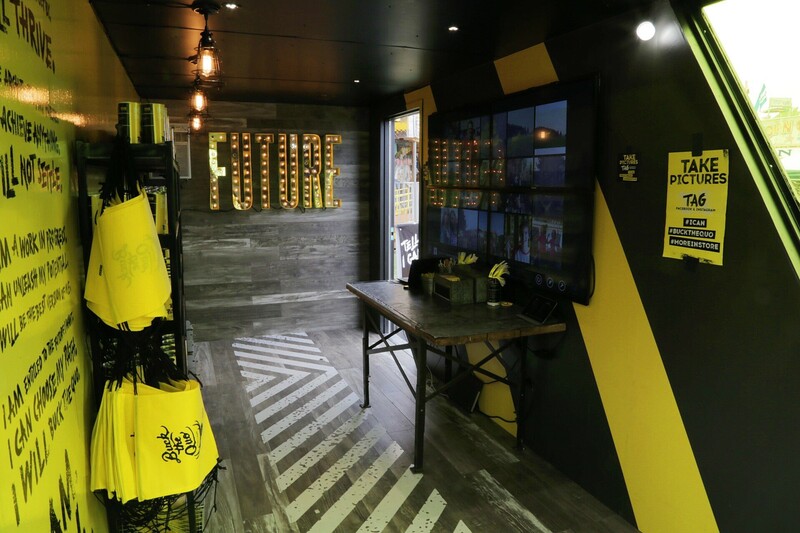 They also have a chance to write themselves an inspirational message based on their goals, stick it in a shipping container, and the Albertson Foundation will ship it off to them in a branded black-and-yellow marketing container. In some places, Groff says, teens don't have much support. He hopes this strategy can buck them up, so to speak, and keep them excited about their long-term goals. 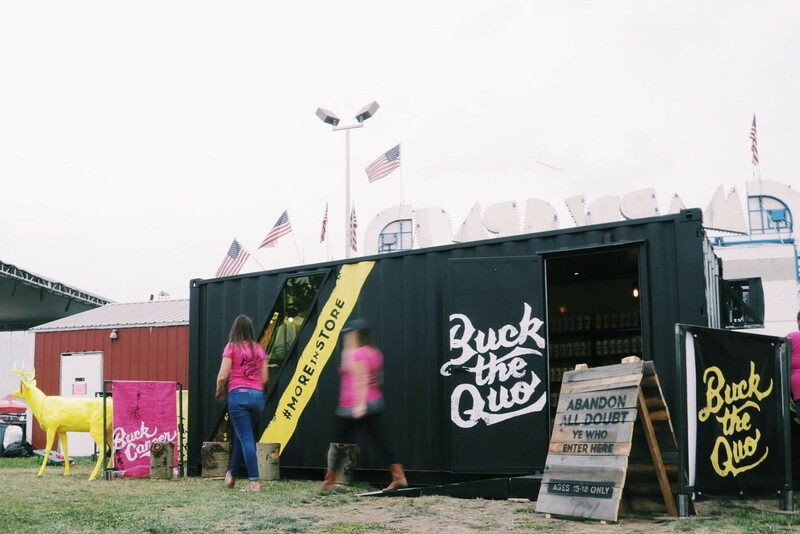 To gin up excitement about their booths, the Albertson Foundation has canvassed local cities with guerrilla marketing. They put 1,000 yellow sprinkler flags with the hashtag #ICan in a park near the Coeur d'Alene Resort. They used sidewalk chalk. 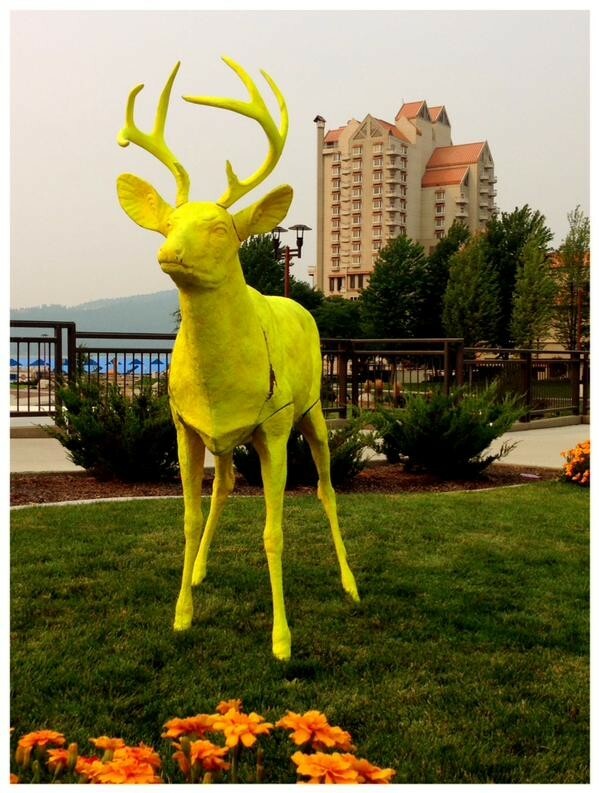 They put two bright yellow deer decoy sculptures in McEuen Park yesterday morning. One deer, however, was decapitated yesterday, and they don't know where the head is now. "We had to lay him to rest because he lost his head," Groff says. "This popup experience is based on the best-in-industry marketing techniques," Groff says. "Some sell credit cards. Some sell junk food. We sell potential." Speaking to teens, of course, is always a tricky tactic. Do it wrong and you end up with a character like Poochie or a tweet like this. "That’s what [the original campaign] 'Go On' did," Groff says. "It talked to adults when we thought it was talking to students. It didn’t work." One strategy is the use of hashtags: Hand the teens the advertising tools themselves. Give kids phrases like #ICan and #BuckTheQuo and watch them post about it on Instagram. (Kids these days don't use Twitter very much, Groff says.) And then when they receive the package they sent themselves in the mail, they'll post about it again. If they win a laptop or iPad, they'll post about it again, and keep the buzz going. That's the hope, anyway. Another strategy is the use of "Near Peers," young advisers who help walk teens through the complicated steps of charting out their goals and how to get there. "We’re in our 20s. We’re wearing jeans, leather jackets and hats and boots," Groff says. "It’s not 50-year-olds talking to them. It’s not an adult-led campaign. ... We’re all from Idaho. We know the region, we know the state, we know the culture. " In January, the foundation will launch a TV commercial campaign, targeted toward a broader audience. "You won’t be able to hide from it," Groff says. "It will be based on experiences of the teens." Some of the messages, photos, and interviews with the teens who visit the fair booths might be used in the ad, he says. "What it comes down to is, we’re not giving up. Go On ended ... . We’re not going to meet that 60 percent [of graduates going to college] goal," Groff says. "For me, and our foundation, we can’t give up. ...If our students aren’t educated, our economy tanks." Inside the booth, the Albertson Foundation hopes teens will find reasons to get excited about their future. Will police ombudsman candidate Allen Huggins' online comments hurt his chances for the job?